Pullback trading is a fantastic starting point for new traders. It emphasizes the importance of respecting the trend and defining your trade risk. The cornerstone of finding pullback setups involves gauging when a pullback ends. In this list, we’ll explore four trading strategies that use price action analysis to do this. Al Brooks popularized the Two-Legged Pullback in his price action trading manuals. This approach is self-explanatory. You want to see the market pulling back with two distinct legs (swings) towards a moving average. To learn how to count price legs, you can refer to the diagram in this tutorial. 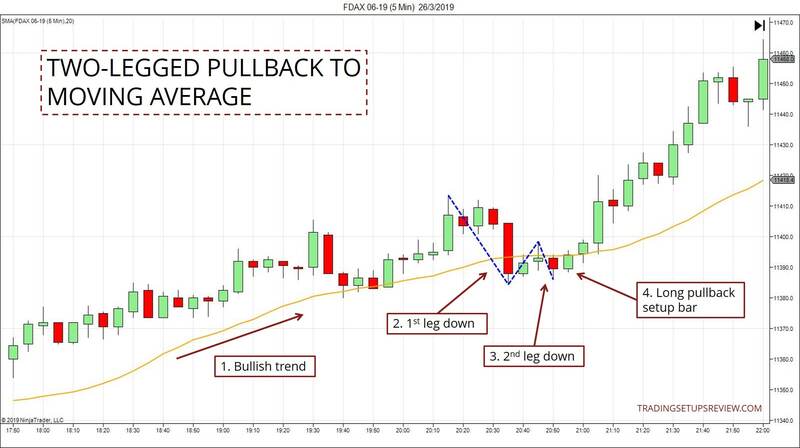 Here, you are making use of the confluence of a two-legged pullback pattern and a moving average. This strategy works well in most trends, except the strongest ones. This is because one-legged pullbacks are more common in runaway trends. I cannot do without trend lines in my price action analysis. If you’re like me, you’ll enjoy looking out for pullbacks using trend lines and channels. Due to the use of trend channels, this strategy tends to involve complex pullbacks. Take a look at the example below. The trend line highlights the market bias. And the counter-trend channel helps to find the end of the pullback by marking out an overshoot. You can also look at this scenario as a failure of the minor trend within the context of the primary trend. The Three Bar Pullback is the most straightforward strategy in this list. It is easy to spot and stays close to price action. Look for three consecutive candlesticks against the trend. There are three patterns pointed out in the chart above. However, if you look at them carefully, they can be interpreted differently. 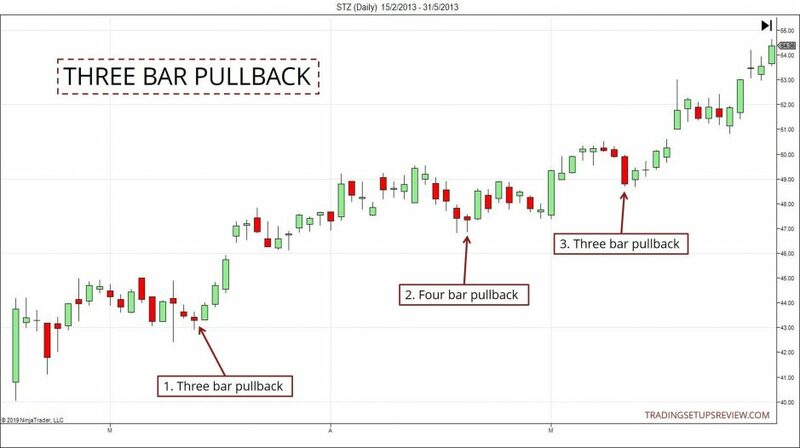 See more Three Bar Pullback examples in this strategy that adds the TRIX indicator into the mix. 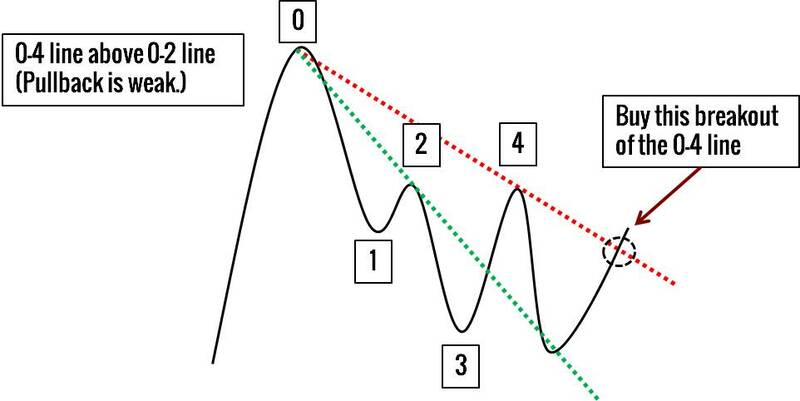 John Hill defined a simple method to find weakening pullbacks in trend. By drawing two lines, the Trend Line Theory highlights the kind of pullbacks you might want to trade. 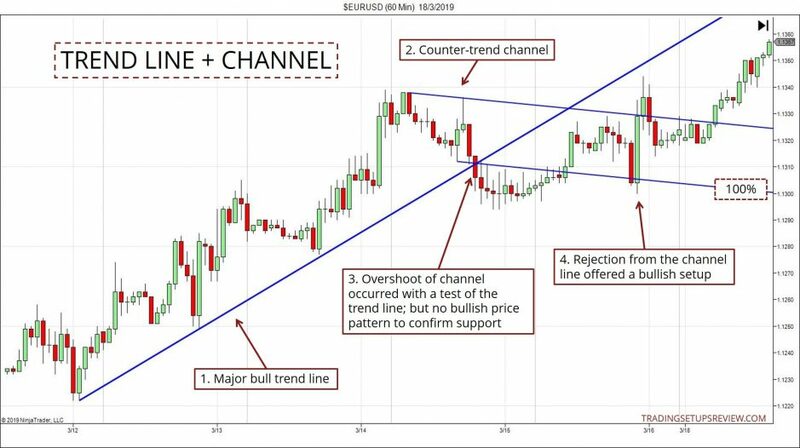 This strategy demonstrates how to use the gradient of trend lines as a basis for designing a trading method. Even if you do not employ this strategy, it’s worth studying for its educational value. For chart examples of this setup, click here. For any pullback trading strategy, tracking the market bias is critical. Get the trend correct, and you will enjoy much greater success with pullback setups. If you are confident that the market is trending, why can’t you just enter the market at any point? It sounds reasonable as the market is on our side in any case. But you will likely need a wide stop-loss to account for potential whipsaws and pullbacks. This will affect your reward-to-risk ratio. Hence, it might not work out profitably for all trading approaches. On the other hand, the price action methods above can help you to find where a pullback is likely to end. Refining your pullback entry helps you to place a tighter (yet reasonable) stop-loss. Thanks for your educational mails.I am really improving in analysing the market with your trading setups.I am looking forward to enrol for your course early next month.I really need a trading mentor. Hi John, great to hear that you’re happy with the info I’ve been sending. All the best to you! And please let me know if you have any questions about the course.